The annual commemoration of the Creek War of 1813-14 is held the last weekend of March at Horseshoe Bend National Military Park. 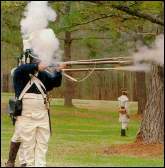 This involves several living history events, musket and cannon firings, cultural demonstrations, and interpretive programs. The commemoration honors the battle on March 27, 1814 when General Andrew Jackson with troops from the 39th US Infantry and the Tennessee Militia, aided by Lower Creek and Cherokee Indian allies defeated Chief Menawa and the Upper or Red Stick Creeks. Other special interpretive programs are offered each month, call the park at 205-234-7111 for a schedule of events.